This evening I made one of my favorite "fast food" meals. 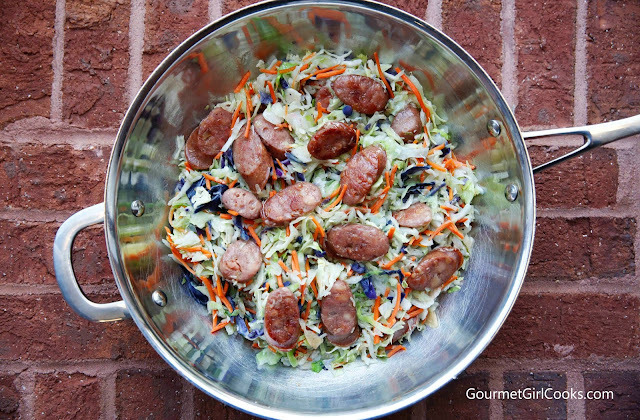 Sausage & Slaw that I simply stir-fry in butter or oil until the sliced Aidell's sausages are browned and the shredded cabbage and carrots (bag of fresh coleslaw mix) is wilted and still tender-crisp for texture. I also make this same dish with sliced brussels sprouts and broccoli in place of the cabbage mixture. I simply slice and brown Aidell's Chicken Sausage Links and brown in butter or oil (I used Kerrygold butter this evening). 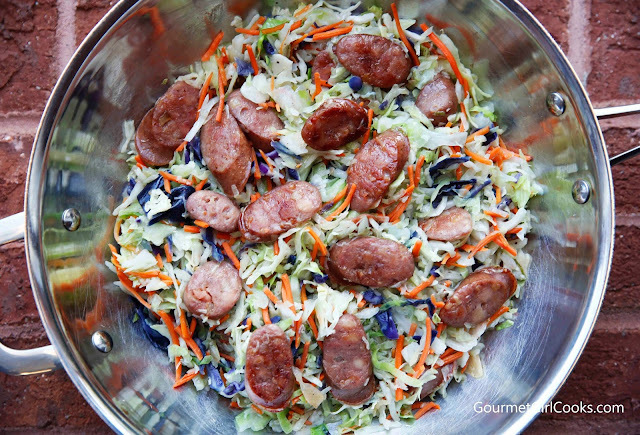 I move the browned sausages over to a bowl while I saute a bag of fresh coleslaw mix (shredded green cabbage, red cabbage and carrots) in butter. I actually used a 2-pound bag of coleslaw mix this evening instead of the usual 1 pound bag. Once it's wilted to my satisfaction, I season it with a bit of salt and pepper and add the browned sausages back in, mix, and serve. That's all there is to it. I made it last week using fresh broccoli florets that I lightly steamed before tossing with the sausage. This evening we enjoyed it alongside some of my lightly toasted Cheese Pinwheel Rolls. It only took about 15 minutes to get this meal on the table. I snapped a couple photos below. Enjoy! In a large 12-inch nonstick skillet or wok over medium-high heat, melt 1 tablespoon butter and add sliced sausage links. Cook, stirring frequently until browned on both sides, about 5 to 7 minutes. Stir in coleslaw mix and about 1/4 cup water; cover and cook until cabbage is tender-crisp or desired doneness, about 5 minutes. Uncover and add remaining butter and cook another minute or until all liquid is cooked off.